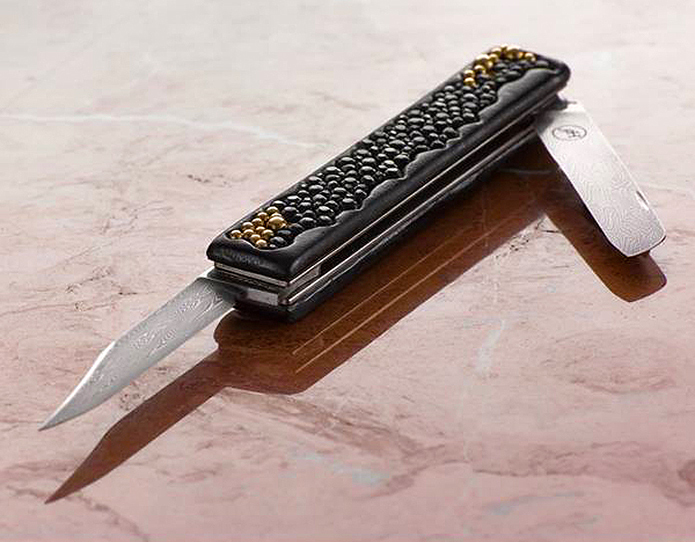 Knives and knife-making have traditionally been seen as a male domain – with knives being perceived, in popular culture, as weapons, or symbols of aggression. However, the knife to most of us is used daily as a tool, often within the domesticated space of the home, in not particularly masculine ways; chopping and peeling vegetables, spreading butters, jams and such like onto bread. 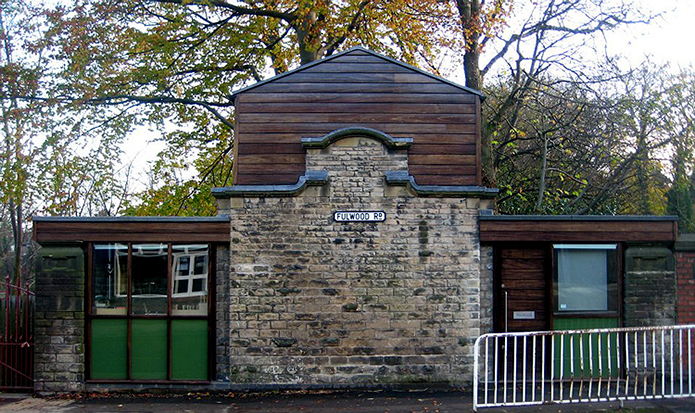 One knife-maker, based in Sheffield, a city famed for its knife-making since the 14th Century when many mills dotted along the banks of the city’s fast-flowing rivers and streams were converted from milling flour to grinding blades using the local millstone grit as grindstones, is preserving Sheffield’s knife-making heritage, at a time when the long era of craftsmen making tools, knives and cutlery from small-scale workshops all over Sheffield – craftsmen known locally as the Little Mesters – is sadly dying out. 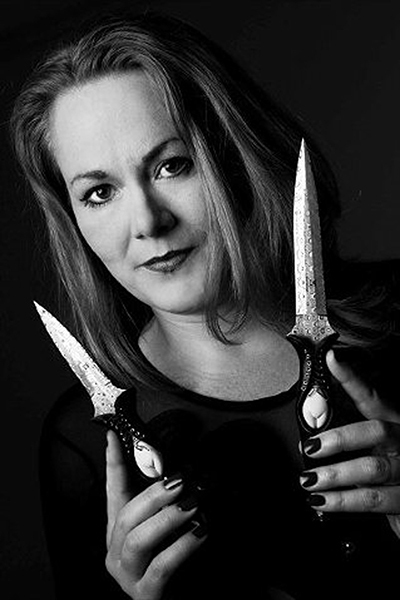 Grace Horne, founder of Grace Horne Knives, has been working with knives since her Design Craft and Technology degree in the early nineties in Sheffield Hallam University, and has not stopped since. 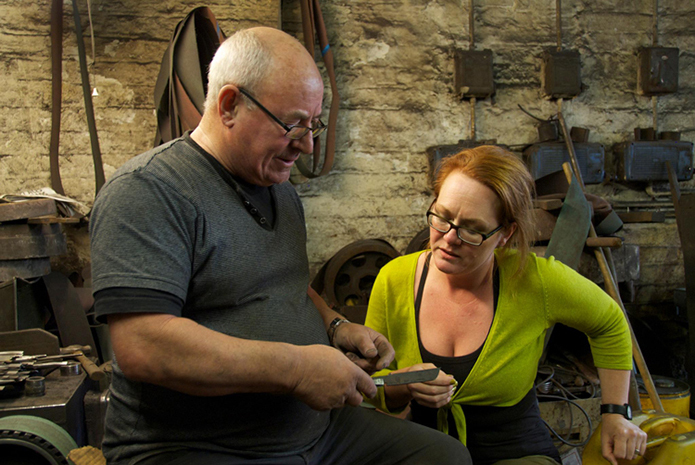 Grace is fascinated, respectful and loyal to the design and manufacturing techniques that made Sheffield, its steel and its blade and cutlery-makers, world famous. Here, Grace guides us through what it means to be a contemporary knife maker, and a female carving her niche (with one of her own knives!) 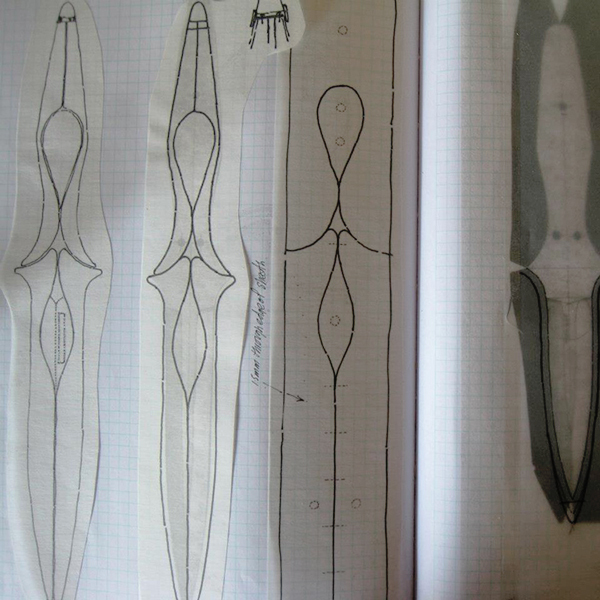 in a male-dominated world, providing an interesting insight into craft techniques involved in constructing an individual knife and how she has married the unlikely medium of textiles into her knife-making. 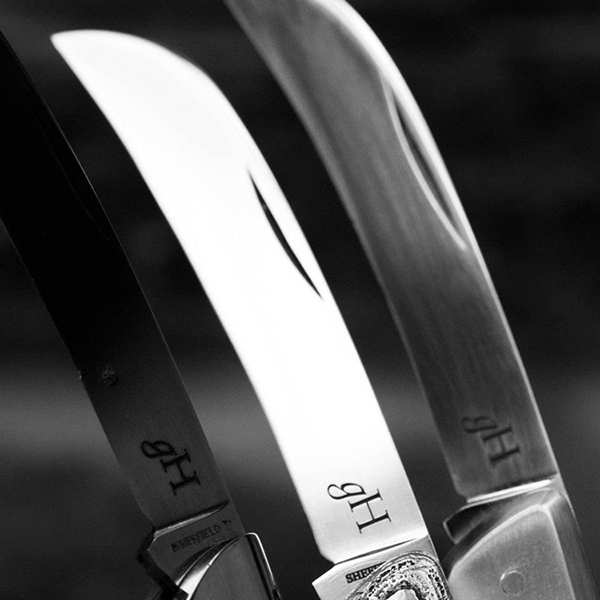 Firstly, to those readers that aren’t familiar with Grace Horne Knives, please can you explain what you do? I’m a self-indulgent maker of contemporary knives based in Sheffield. All my knives are fully functional, working tools, but generally they are acquired for collections. I only make a limited number of knives each year, and so in that respect I’m not what you would call a manufacturer. In additional to making knives, I make the knife packaging myself, I write books that explain and document the knife-making processes, and I lecture on the subject. Recently, I have been involved in scissor-making, so that I can develop my understanding of scissors, which I incorporate into some of my designs. 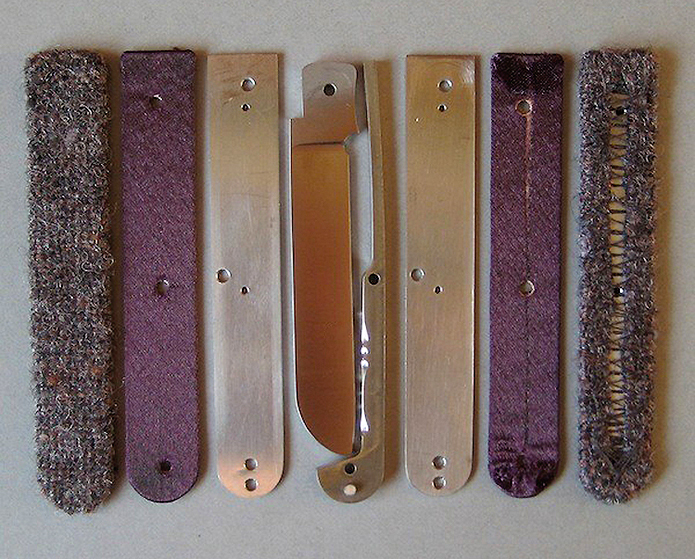 Rather than repeating the same knives, I am constantly creating new designs, incorporating new styles and materials; I’ve started to reincorporate textiles back into my knife work, for instance. The challenge for me is to keep coming up with new designs; once I know that I can make a knife, then I don’t want to bother making it again. I made some distinctive daggers which sold really well, it was almost too easy, but the problem is you can get pigeon holed in doing something, and I want to avoid that. Sometimes, I will use a shape similar to a previous design, but that will be the only similarity. 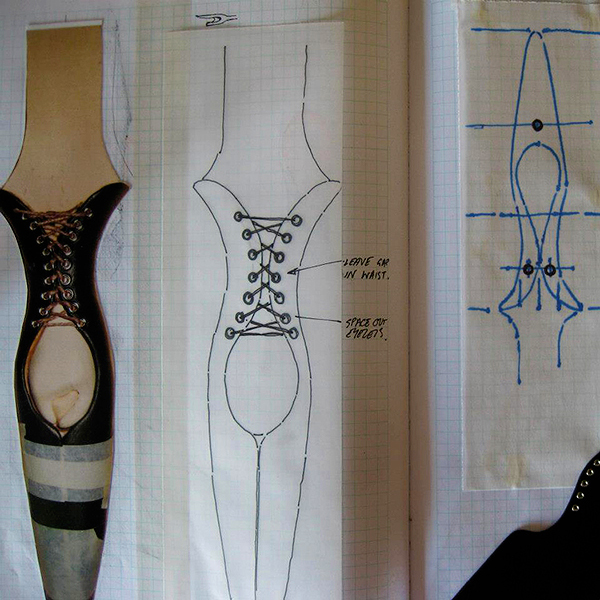 I never set out to make anything that is distinctively me or my style; my designs just evolve. I have some clients who want a certain type of knife who will wait five or six years until such time as I’ve decided to make something in a style that will appeal to them. Knife-making for me is a combination of both art and craft; it’s concept driven to start with, starting with a story, and thinking of the materials to make it work, and then the craft side is the experimenting and playing with the materials, and then setting about making the knife. Once I have an image in my head of what the knife will be, I will spend my time in the workshop trying to manifest the idea. Sometimes I might have to re-make the knife five or six times before I get it absolutely right; maybe the grind on the blade isn’t spot on, or the mechanism doesn’t feel quite right, but with every step it’s getting closer to perfection. I make many, many more knives than I sell, but I’ll end up destroying them and re-using the parts if I’m not quite satisfied with them. My knife-making journey is really just a series of steps to perfection; I hope to get there one day. Sheffield is an area world famous for knife-making; could you explain some of the history behind the industry? Sheffield is intimately associated with knife making and metal industries; it was really integrated into the community, and in a way it still is. Knifemaking (and other light trades) was carried out by the Little Mesters; the Little Mesters (‘Mesters’ is a Sheffield derivation of the word Master, so they were really known as Little Masters, or master craftsmen!) were self employed craftsmen who rented workspace or worked from home, making knives and cutlery. In the 1700s, these craftsmen would make the entire knife, but as demand grew it became difficult for one person to do all the tasks themselves and there was a division of labour and segregation of tasks, so some people would be involved in forging the blade, others assembling (the coupler), and others selling. The coupler was the key person in Sheffield. They were cottage industries in the original sense of the term. The Little Mesters were employed by a Master Manufacturer, who had the finance to cover all stages of production and market the products. There were several companies each employing a hundred Little Mesters, and many more smaller companies. This worked well for the Little Mesters when demand was high for their products, but in slumps, as they were self employed, life could get very tough, as they didn’t have the income to cover their living costs and workshop rent. People romanticise about the Little Mesters, but it was certainly tough for them. The Little Mesters have pretty much gone, although there are still people working in knife making in Sheffield, but they’re just not the Little Mesters in the original definition. In fact you might be surprised to know that there are more blades made now each year in Sheffield than there were 150 years ago when there were literally hundreds of Little Mesters working; the company Swann Morton is a large volume producer of scalpel blades today, but the factory is all mechanised rather than employing teams of craftsmen. According to the British Knifemakers Association, across the UK there are between thirty and forty people who derive the majority of their income through knifemaking (aside from those working in larger companies), of which there are three or four still working in Sheffield, all in their 40s, so for the short-to-medium term at least, the future is pretty good. 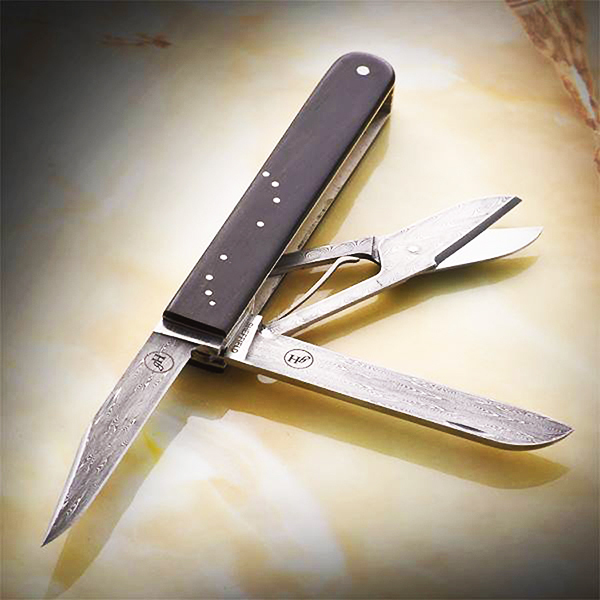 A lot of people in Sheffield have memories of people they know connected with knife-making, older members of their family or friends, and you’re certainly not treated as a social pariah as in other places, which is nice as people respect what we do. 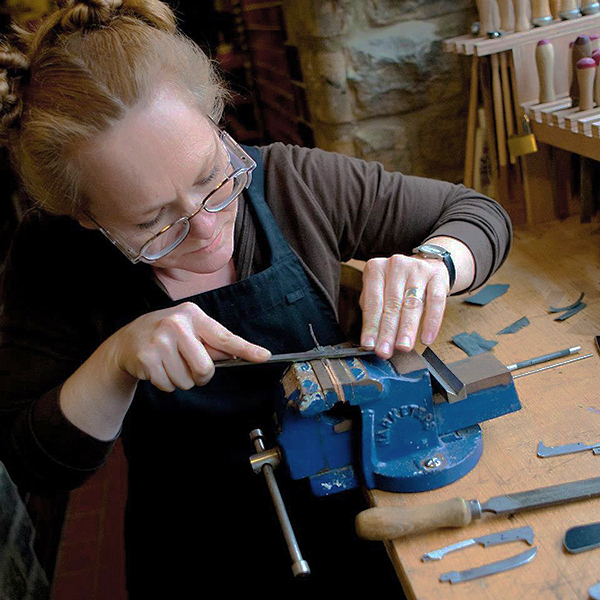 What inspired you to want to take up knife-making as an academic subject area and as a professional career? I dithered between textiles and metal as a degree choice; my mother worked in textiles, and so this was the safe option for me and I therefore knew I could return to that if I so wished, and so I chose metal. I had considered jewellery, but I felt it was a bit small. My first attempt at knife-making was for a final year degree project, and I made a set of three folding pocket knives. I went on a course through the British Artist Blacksmiths Association to make the Damascus steel for the knives, and it was there that I discovered that people were still making the famed Sheffield knives, which really fascinated me. I had heard of Stan Shaw, one of the last of the Little Mesters, and I approached him after I completed my degree to see if I could become an apprentice to him; he would have been in his 60s then. Unfortunately he had someone else working with him in his workshop, and there wasn’t the room, but he did give me a box of old Sheffield blades and springs and told me to figure it out and come back to him. The blades were exquisite little things; completely untouched, but they must have been 150 to 200 years old. That was almost twenty years ago, and I still haven’t figured out how I’m going to use them, although I’m getting there! I still moved to Sheffield regardless, but instead of taking up an apprenticeship, I took up a Masters degree at Sheffield Hallam University, which later turned into a PhD in metalwork and jewellery, with an emphasis on patterned steel. Taking an academic route was always a means to do the work and gain experience, rather than simply to gain a qualification. As part of the degree I was able to work with traditional knife-makers, as well as work with the latest technologies and techniques, so my work is a fusion of both traditional and contemporary. You came into knifemaking having had an academic background, which is very different to the famous Sheffield knife-makers Trevor Ablett and Stan Shaw who served as apprentices as young men over 50 years ago; do you feel your academic background has helped or hindered you in setting up your own workshop? Whilst I’ve come from an academic background, it wasn’t at all theoretical; it was all hands-on work, so in that respect it hasn’t been as much of a leap to establish my own workshop as it might have been. There’s no doubt my academic background has helped me. The rigours of working in an academic background have provided me with the opportunity to develop a language to explain what I do at a blade show in Paris or the USA, for instance, that I probably wouldn’t have been able to do otherwise, and the expertise and facilities at the University to support me and my learning were excellent. Not only that, but there are skills that I’ve learned, or had access to certain materials, that simply wouldn’t have been possible if I hadn’t been associated with the University. The University still has ties to industry, so if I need to have something laser cut, or need to order a small quantity of materials, then companies are willing to help me if I mention that I’m connected to the University; they’ve never seen me as from a competing background. I have to say, though, that there is a big difference in the way that I operate now compared to the knife-makers that you mentioned. Given the volume they are making, their knives have to be good enough to be made in a certain amount of time; they simply don’t have the time to keep going on a knife until it’s absolutely 100% perfect. For me, the last 10% of a knife might take 90% of my time, and it’s this last 10% that is critical to me. Of course, that couldn’t be justified from a normal business perspective, and if I had to support my family on a sole income derived from knife-making, then my knives would look very different to what they do. The traditional Sheffield approach was very pragmatic, and it had to be. It does me good to work in this environment from time-to-time to remind myself to stop being a perfectionist. I understand that you only make a limited number of knives per year; but given the demand for your products, are you tempted to increase production? I choose to make a limited number of knives because I divide my time between other things as well as knife-making, such as teaching, designing and caring for my family. At the moment it’s simply not possible to produce any more knives, and in any case, I don’t want to be known as a ‘manufacturer’ of knives. 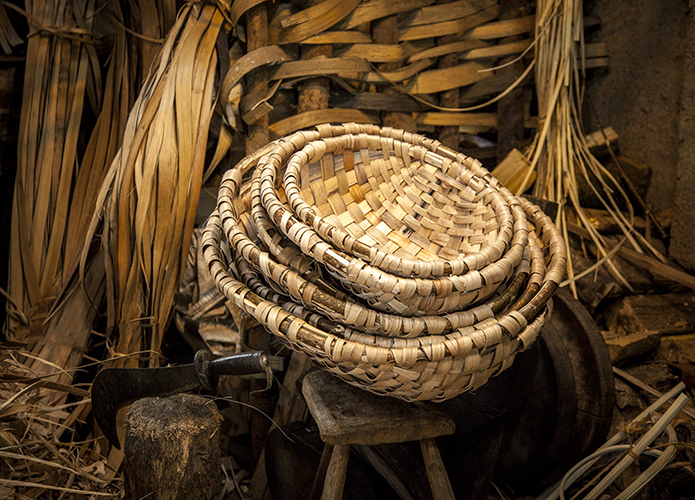 Gone are the days when the only way you can be respected as a bona fide craftsman is by churning out large volumes. I certainly don’t feel the need to validate my work by being full-time; there’s a huge amount of mediocre craft work out there being made by full-time people, and conversely there’s some really high quality work being produced by people on a part-time basis. I’m taking a pragmatic approach to this craft, and want to encourage others to do the same. I understand that you work from quite a quirky workshop; could you describe it to us and explain in what ways you are inspired by your immediate working environment? 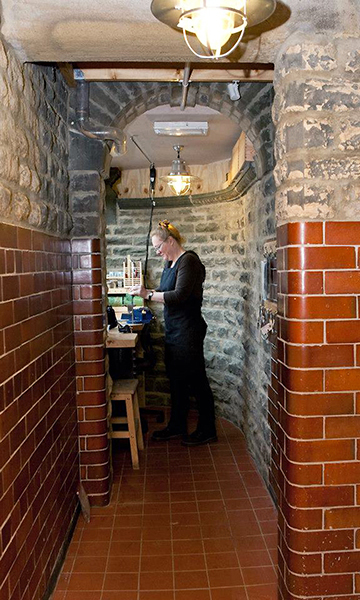 My workshop is a beautifully converted Victorian public toilet, which my friend, an architect, helped design. It was built in 1906 and used by male tram drivers at the time. In terms of usable space, it’s a very small workshop, more like a dolls house, but it’s great as a craft studio. I have a workbench that overlooks the street. Next door is a school, and passing kids come and look in the window and see what I’m doing that day. I also have a bus stop outside, and people queuing also have a look in. I often make paper models and leave them in the window to show what I’m making. I really enjoy engaging and interacting with the public. Knife-making has traditionally been seen as a male-dominated craft; has gender ever been an issue when making or marketing your knives? Knife-making is perceived as a male thing, but in actual fact a significant amount of women made cutting instruments, such as knife blades, scissors, files and the like in previous centuries, certainly in Sheffield. If you go into many of the old terraced houses in Sheffield and lift up the flooring in the kitchen, you’ll see the base of the anvil on the floor, which is where women were making their knives on the anvils whilst they were looking after their children. Also, in the bottom of the gardens of these houses, you’ll see what looks like an outside double toilet; one side of it will be a toilet, but the other half will be a tiny workshop. Admittedly, though, in modern knife-making, women aren’t common, but it’s never been an issue for me and I don’t ever think about it really. It’s only once you look afterwards at photographs taken at the knife exhibitions and shows that you realise you’re the only female present in the picture. I can honestly say that no-one has ever made me feel uncomfortable, and I’ve been really pleased with the reception I’ve received via the online knife and blade forums too. Do you use the same techniques as knife-makers from previous generations, or have you embraced new technologies? I do both; I embrace both old and new technology. I wouldn’t use an old technique just because that’s how they did it in the old days if there’s a better way of doing it; for me it’s about efficiency, it’s about getting the right technique, whether that’s a redundant technique that I need to learn, or using a CNC cutting machine, I don’t mind. 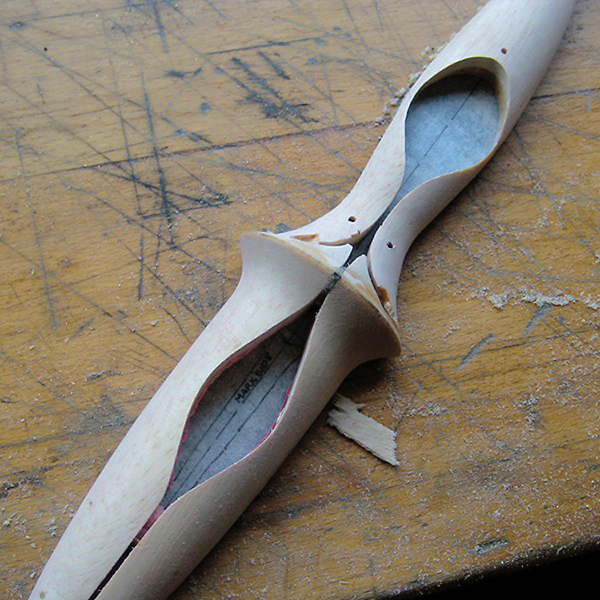 The techniques of knife-making do vary from place-to-place. For instance, in America, knife-making is more engineering based, they tended to screw their knife handles together, whereas in Sheffield they riveted them; riveting takes up less space and can make a more delicate knife, but they can’t be disassembled so easily to replace parts or for cleaning. Depending on the circumstances, sometimes I’ll rivet and on other occasions I’ll use screws. I generally learned from American techniques for knife-making, but that’s probably because there is more information on their processes than in Britain, but I still use Sheffield techniques; I tend to cherry pick the best of all the different techniques. 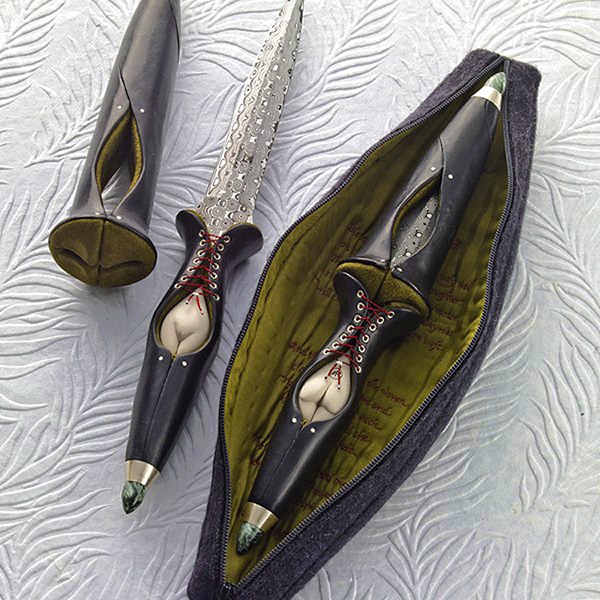 Some of your designs incorporate textiles within the knife handle, which is very unusual. How do you select the materials that go into your knives and what are the reasons for using them? I select the materials depending on what the knife is for. A lot of my intent is to cover up the aggressive look of a knife, so that people won’t be inherently frightened or intimidated by them. 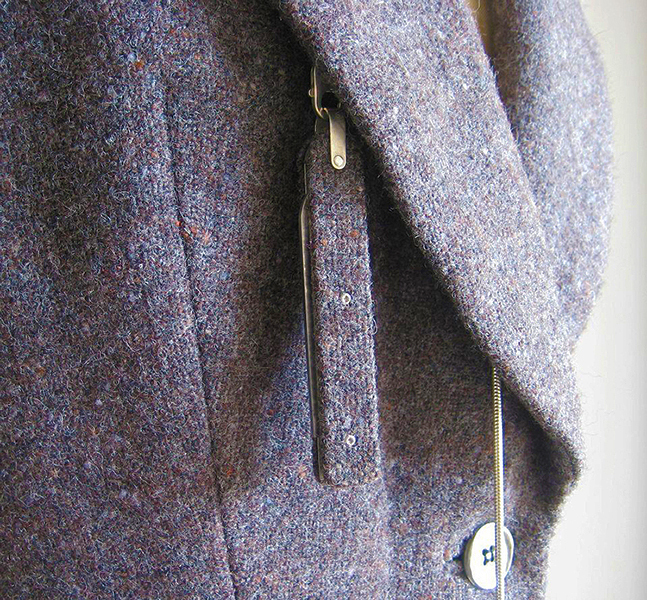 Sometimes I do this by incorporating felt into or onto the handle, other times it’s leather or lace. Likewise, it could be silver or wrought iron. I want to improve on all the aesthetics that are a problem for people, and reinvent the knife from being seen as aggressive, nasty and sharp, and more about what it should be which is a tool, and one that can be very aesthetically pleasing, whether that’s for a collection or for everyday functional purposes. I definitely don’t set out to challenge gender by incorporating ‘girlie’ styles or materials; there may be one or two which are, but most of them incorporate materials that are gender neutral. I want to challenge people’s perceptions of knives, that’s all, and I think choice of materials can help that, along with design style. 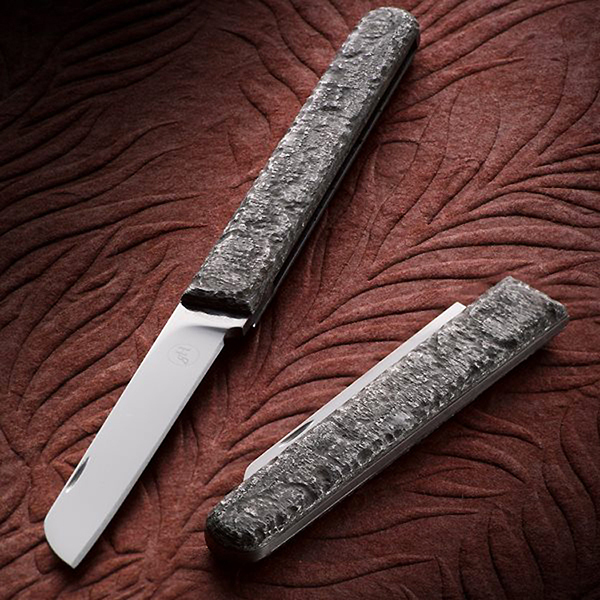 Could you talk through the process of how you approach making one of your knives, from taking the raw material and turning it into the finished article, to give readers a glimpse of the process? 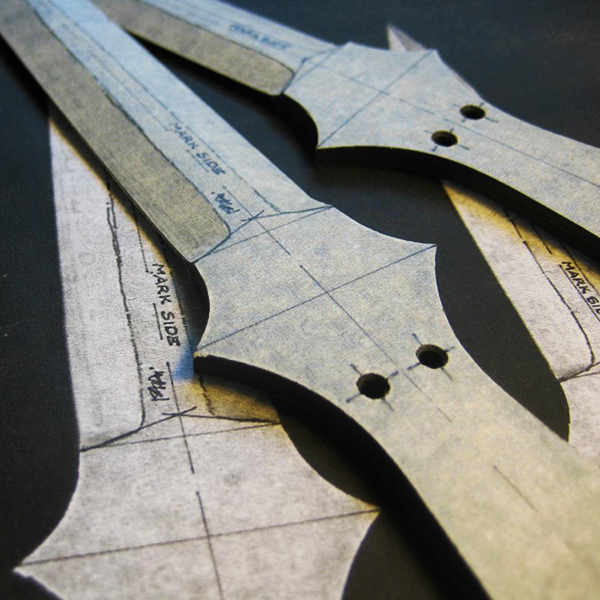 We created a paper template of the design showing rough models and ideas based on the actual steel blades that Guy worked on. The design needed to be checked so that it would work on the actual blades, so we photocopied the blades which allowed us to draw on the exact paper replicas. Our next job was to turn the timber support handles and sheaths which would be covered in leather. A template was used to ensure the curves of the template work with the three dimensional shape. 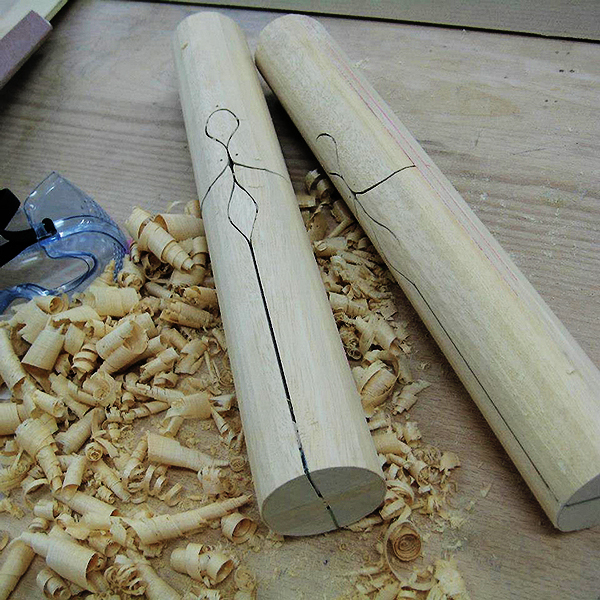 The wood was shaped on a lathe and then by hand for an accurate finish. The wood was then split. 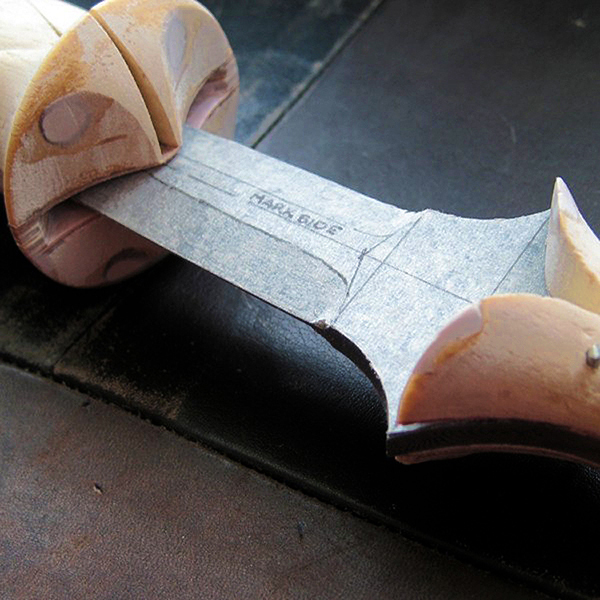 The insides of the sheaths were formed to allow enough room to allow the blades to sit inside perfectly. The handle would be covered in black glove leather and stitched. 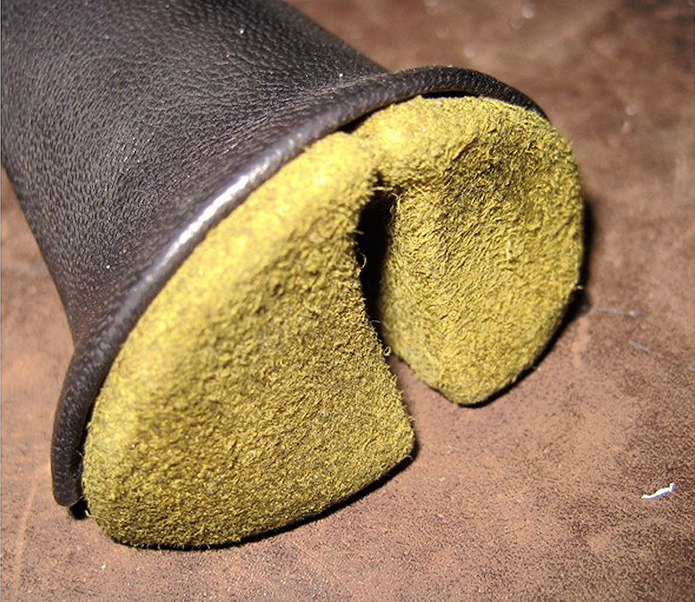 The sheath was lined with moss green suede glove leather. Each half would be cut in half again lengthwise to form quarters. 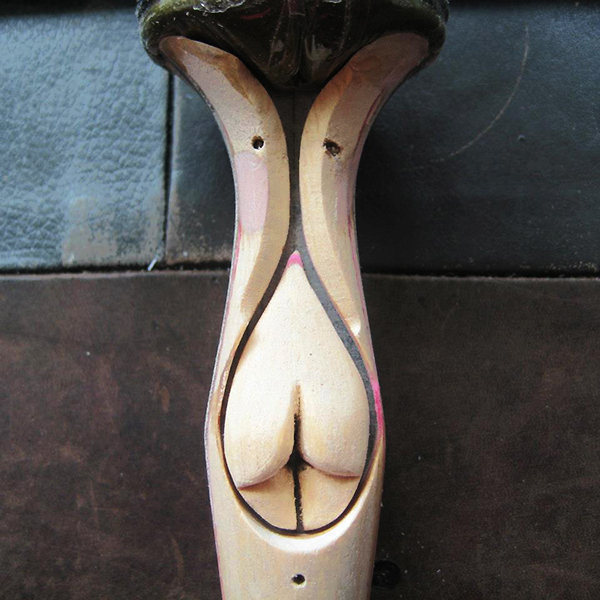 Inserts would be added into the handles in the shape of little bottoms. 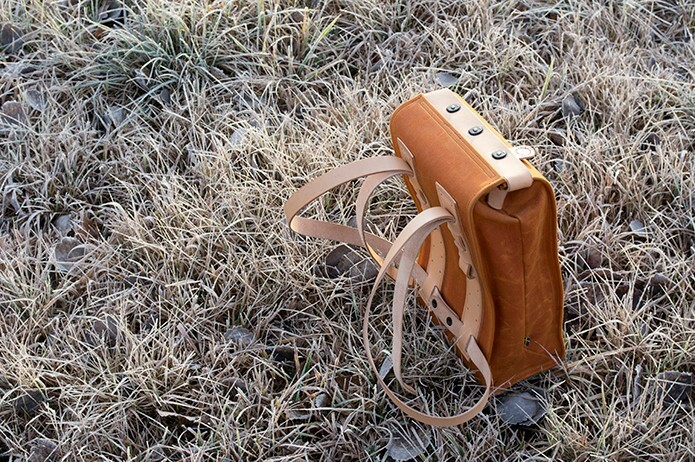 The handles would then be covered in the suede and leather and stitched together. Red silk thread would be used through the eyelets. Rivets made out of silver wire would also be used to hold the handle together. 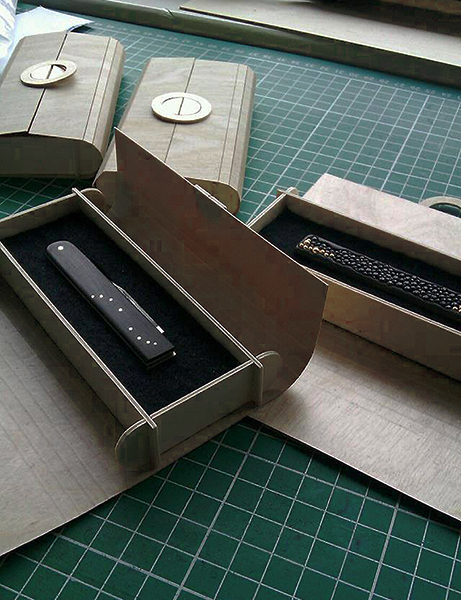 The finished pair of daggers fit into a case. 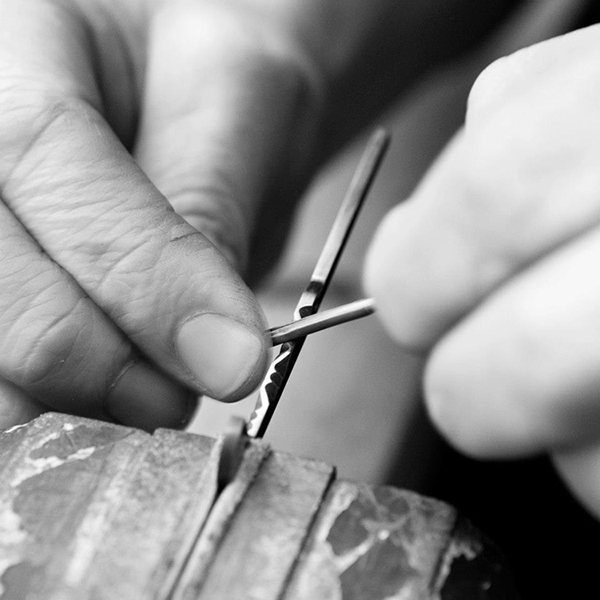 Are there recognised training programmes for people interested in commencing a career as a knife-maker, and what advice would you give to someone looking to get started? As a starting point, I’d advise anyone to look at the online forum British Blades; it’s packed with lots of really interesting information, and it’s one of the few forums that is British-based. 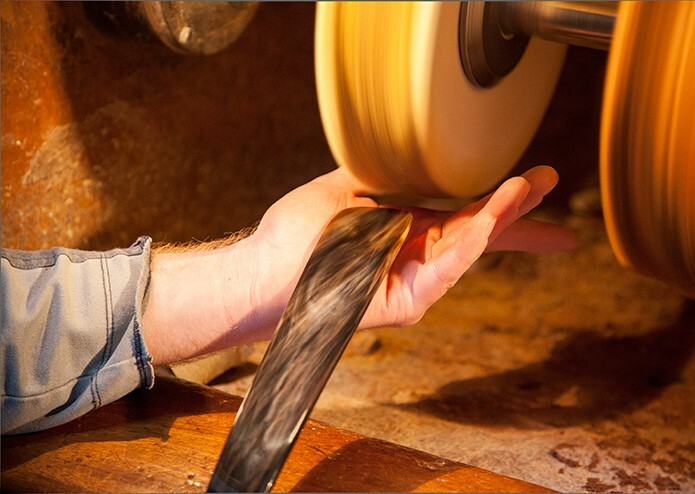 There are several knife-making courses that you can attend around the country, which will allow you to get started and provide a good insight into what knife-making is all about, the components, blade types, assembly and so on. There’s a huge amount of information out there on the website, and I’d advise anyone considering this as a career to spend us much time soaking up information and practicing as possible before committing to it. You really need to decide what style of knife you’re looking to focus on – whether it’s kitchen knives, outdoor/survival knives, or others, and it’s better to refine this thought process before you start committing to investing lots of time and money, as it becomes quite specialist. 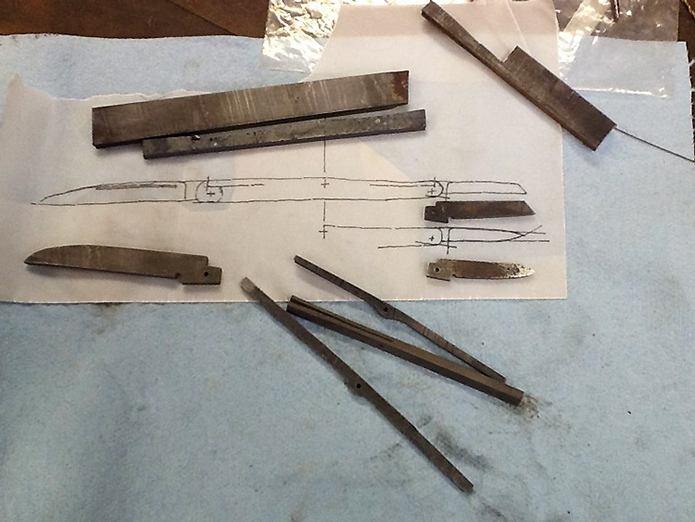 There aren’t any full-time knife-making courses through. 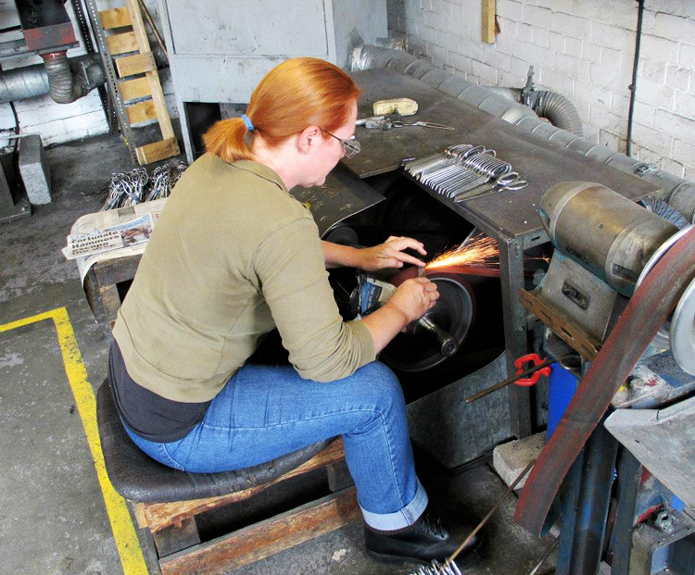 However, a lot of people who forge knives have come from a blacksmiths background; many of which from the Hereford College of Arts, which has the largest forge training facility in Europe. 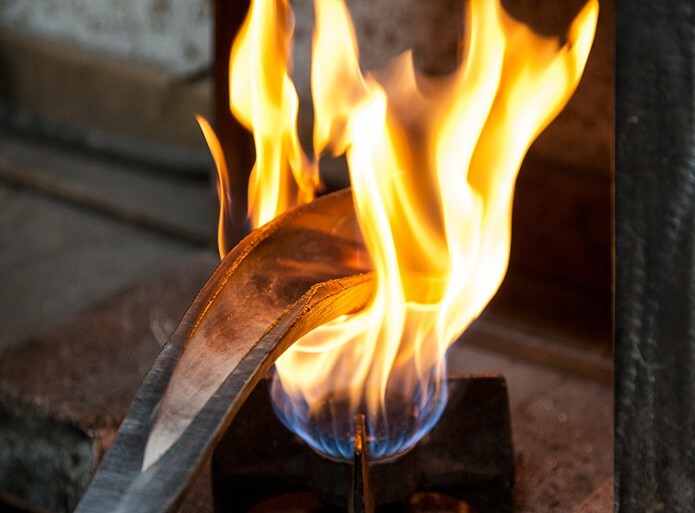 Whatever your background, whether it’s blacksmithing, engineering or something else, you need to incorporate these experiences into your own particular style of knife-making so that you make the knife your own. 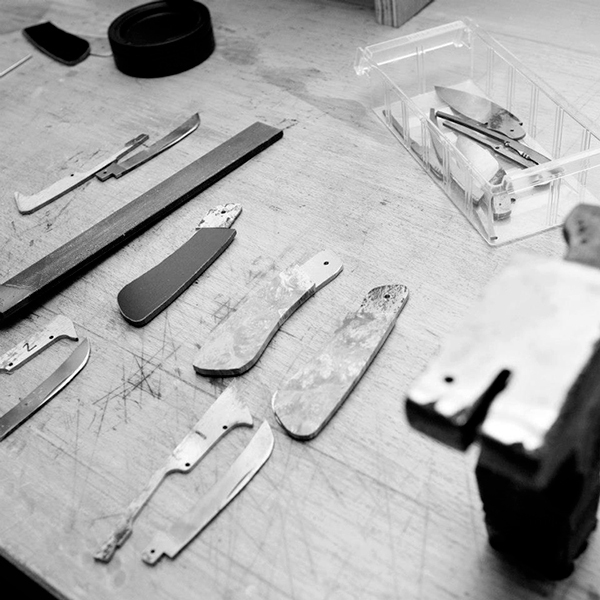 Finally, what are your thoughts on the future of the craft of knife-making in Britain? 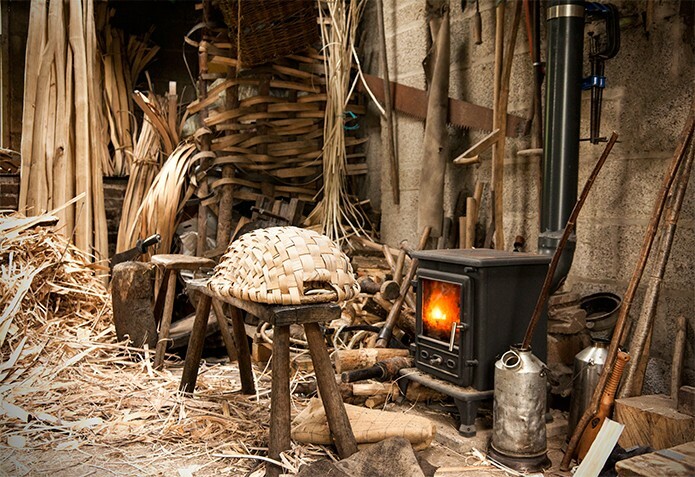 I think the future of the craft is favourable; it certainly seems to be growing in Britain. 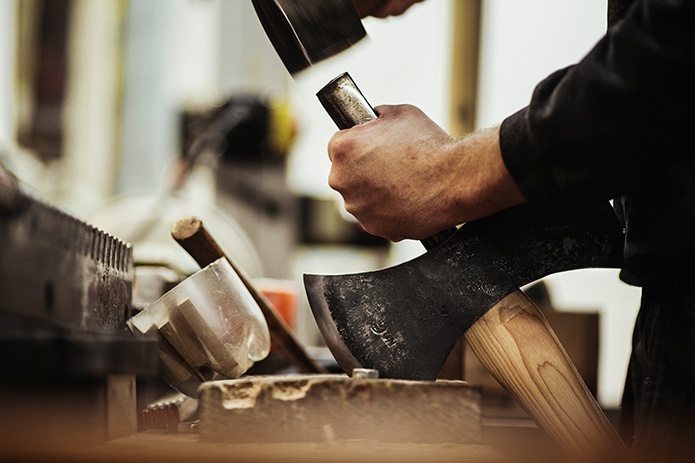 Some of the growth is down to craftspeople who are making knives for their own needs, such as a leatherworker who might want to make their own knives because they can’t find the tools they need, or a thatcher may want a billhook of a particular style and strength which he can’t get elsewhere. 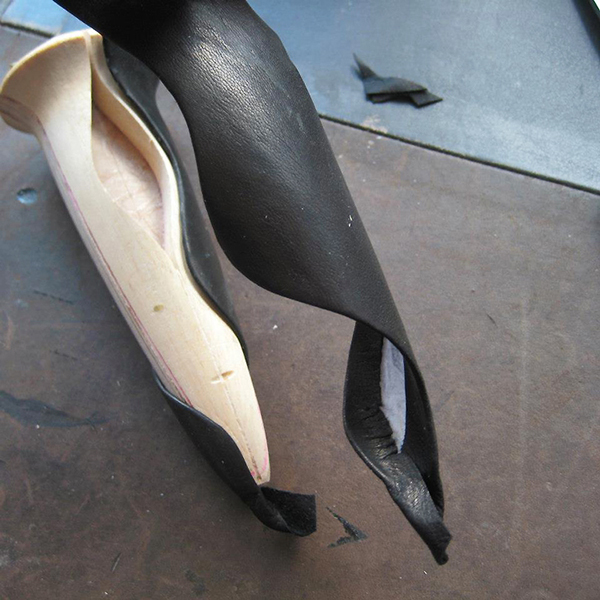 In these situations, I find the craftsmen who make their own tools derive a lot of pleasure and it enhances their craft. People that feel part of the craft community invariably want to be using crafted tools, rather than mass-produced tools from the Far East. I think the number of knife collectors is increasing in the UK and around the world, which is obviously good for the craft. I’d estimate that there are hundreds of people making knives in Britain, whether that’s for kitchen knives, pocket knives, outdoor and survival knives or for other purposes, and on top of that there are the thirty or forty people earning a full-time living from it. Image courtesy of Eric Eggly, Point Seven Studios. I think craftspeople will collaborate with large knife-making companies, helping to design and prototype their knives, to make them nicer, get the fit and finish right. Craftspeople have the resources that can feed back into large companies that don’t have the money to spend on R&D; new patterns of knife steel are being brought out by knife companies, but invariably this originated from blacksmiths playing in their sheds – it’s people like them, and not the factories, that are making this happen. I don’t think the knife industry can do without craft knife-makers. Dare I say it, but I feel that when the likes of Stan Shaw and Trevor Ablett eventually retire, I think it will be tough for anyone to take over from them doing what they do. These men trained up as apprentices from the last of the real Little Mesters in Sheffield and are producing quite large volumes of knives each week, and they’re competing with the Far East! Most men these days aren’t prepared to put in the long hours to be able to compete with the Far East, and I think it will take someone with an excellent knowledge of the knife industry, and a pragmatic business approach, to be able to continue their legacies. We’re so used to thinking of knives as a weapon these days; we need to reclaim the knife as a tool, a functional tool. I like to think that I’m doing my bit in securing its rightful place.